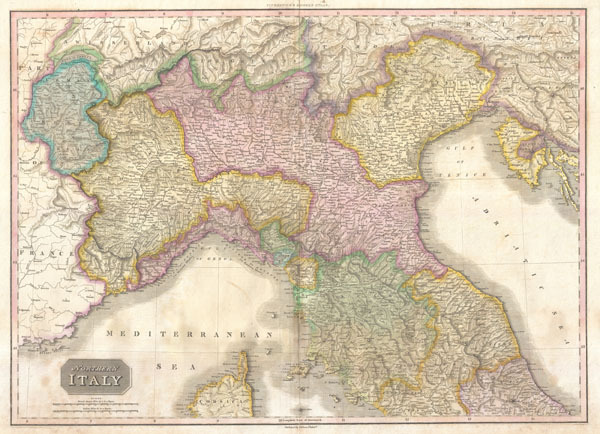 A stunning map of Northern Italy by John Pinkerton. Depicts from Switzerland to Corsica and from France to Venit Istria. Includes Tuscany, Piedmont, Mont Blanc, Genoa, Luca, Milan, Umbria, and the Venetian States. Offers extraordinary detail throughout noting mountain ranges, river systems, cities, towns, mineral resources, and other natural and unnatural features. Drawn by L. Herbert and engraved by Samuel Neele under the direction of John Pinkerton. The map comes from the scarce American edition of Pinkerton's Modern Atlas, published by Thomas Dobson & Co. of Philadelphia in 1818. Very good condition. Minor discoloration along original centerfold. Minor dampstaining in lower margins. Blank on verso. Rumsey 0732.030. Phillips (Atlases) 724. National Maritime Museum, 409.